As with any other perennial, success depends greatly on soil preparation before planting and having good drainage. Ideally, the planting areas should be prepared in the fall, beginning with deep tilling of the soil. Fall tillage facilitates freezing and thawing action during the winter, and improves soil tilth and workability. If this is not possible, spring tillage is also satisfactory. Incorporate ample organic matter during the tillage process. Ornamental grasses do not require high amounts of fertilizer. Adding about one pound of a general-purpose fertilizer (like 10-10-10) during soil preparation per 100 sq. ft. of planting bed should be sufficient. 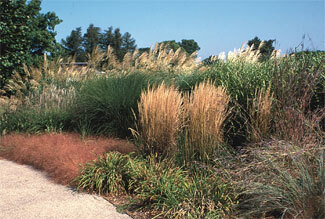 Ornamental grasses can be planted in the spring or the fall. The advantage of spring planting is to give the plants adequate time to develop a good root system before winter. Fall planting is often not as reliable without some additional precautions, particularly in years with early or severe winters. You should try to complete fall planting during August and September. Then provide a light cover of straw or hay during the first winter for best results. Apply the mulch after several hard frosts. Plants should be planted no deeper than their previous growing depths and should be well watered after planting. Maintaining uniform soil moisture around the plant hastens establishment. Plants planted too deep tend to develop root diseases or simply rot in the ground.